That’s an acronym for The End Of The World As We Know It. Pronounced “Tee-ought-walk-ee,” it refers to some catastrophe (natural or man made, such as global war or some other doomsday scenario) that causes the total collapse of the world system. That phrase at the end sticks in the mind. Unshakable essentials. That says it all. God is shaking the earth so that we will figure out what matters most. These “signs” are present to some degree in every generation, but they will be especially visible as we approach the end of this age. The crucial question involves how close we may or may not be to those end-time events and ultimately to the return of Christ to the earth. Verse 8 warns us about the dangers of too much speculation. No one can say with certainty when Christ will return. Both the disciples (v. 3) and Jesus refer to “the end” (v. 14). 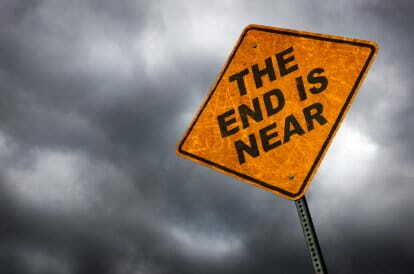 That means that there is a time appointed by God in which the world “as we know it” will come to an end. The terrifying events of the Last Days will usher in the glorious Second Coming of Jesus Christ to the earth (Matthew 24:29-31). (For those wanting more detail, I wrote about this inThe Last Days According to Jesus). If we take no other comfort from the words of Jesus, we ought to rejoice that he is the Lord of history and the master of all earthly circumstances. Because he is the Son of God, he could see clearly into the distant future. He knew about the wars that would ravage mankind, and he knew that his followers would be brutally attacked. He knew that many false messiahs would claim his name, and he also looked to a day when the true gospel would be spread across the earth. No wonder he could say, “See to it that you are not alarmed” (Matthew 24:6). That’s a good word for times like these. The very next sentence reads: “Such things must happen.” This is not a promise that we will be spared from suffering, but it is a declaration that hard times are foreknown by the Lord. They “must happen” because Almighty God has willed it so. The world “as we know it” is coming to an end. There are many things we know and many things we don’t know about the future. This much is certain: Jesus is coming again. His return may be sooner than we think. Our Lord and our God, we are glad that this world as we know it will not last forever. We look forward to a better day when Christ himself shall reign on the earth. Until that day comes, help us live with our hearts lifted toward heaven, waiting and watching for Jesus to come again. Amen. What signs do you see that the world “as we know it” is coming to an end? How close to you think we are to the coming of the Lord? Would you be glad or sad if Jesus came today? What do you need to do to be ready for his coming?